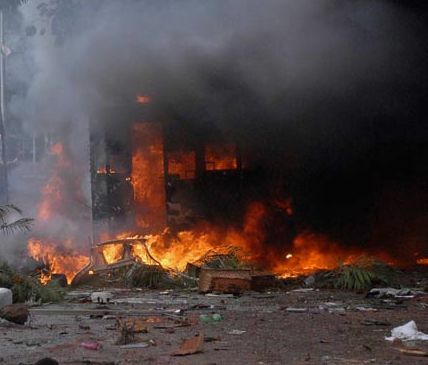 The violence in Dhule Maharashtra seems to be the new face of communal violence in India. As per the report of a major national daily (Jan 26, 2013), the evidence with the newspaper shows the evidence of police looting and destroying the property. The video clips in possession of the civil society groups also show one police official exhorting the rioting mob to move on. So far even if it was there it was not so blatantly clear. One sensed the partisan nature of police as discerned through different inquiry commission reports, but this type of role of police is a new and downhill chapter in the history of communal violence in India. Communal violence has been a major menace to our nation, from last more than a century, and more particularly from last three decades. Rise in communal violence can be correlated with the British policy of ‘divide and rule’. This policy was achieved by them by introducing the communal view of history through different books by British authorities. The communal version of history was taken up by the Muslim and Hindu communalists to suit their political agenda of opposing the political, social and economic changes which aimed at Liberty Equality and Fraternity. The communal forces spread hatred against the ‘other’ community, the result being that the communal perceptions started being part of the ‘social common sense’, hatred for ‘other’ community became the foundation on which the communal violence took place or was orchestrated. This in turn strengthened the communal forces in different areas, and increased the levels of misconception for the ‘other community’. This parallel and opposite process went on till the tragedy of Partition, which was the biggest act of communal politics, the outcome of British policy of ‘divide and rule’. During British rule the communal violence was a communal riot. In this both Hindus and Muslims were pitched against each other in an inhuman way, regarding; perceiving as if they are doing something for their religion. The political agenda of retrograde forces wore the cloak of religion. While communal forces made merry, the innocents suffered and the police took a neutral stance. They were trying to balance out without taking any sides while controlling these acts of violence. This neutrality of police started changing after Independence, when gradually the communalization of section of police force started taking place and its overall neutrality started getting eroded by the day, to the extent that later a section of police started helping violence in a pro active way. And over a period of time, those who are supposed and are duty bound to protect the innocent citizens, became partisan. Shooting the minority community members and throwing them in canals (Meerut Malyana 1987), or burying them in the field and growing cabbage over them (Bhagalpur 1989) was painfully observed. A whole ‘Riot mechanism’ gradually came up in which the communal forces instigated, the so called secular forces looked on or subtly helped and the police took sides with majority community. At the same time the political leadership, bureaucracy, and police who are supposed to protect the innocent citizens, failed to do their assigned job and still got away without getting any punishment. This impunity gave a signal to them all that they can carry on with this game of marginalizing the minority community and reap the harvest of communal politics on the electoral arena. This ghastly situation is taking a further turn for the worst. And now it seems the communal forces and the communal foot soldiers are having an easy time as sections of police force are blatantly communalized. Police not only has become the active player in the game, police is shamelessly providing a cover to those indulging in violence. This painful fact comes to surface in the recent violence in Dhule, 6 January 2013, where over 40 people from the minority were shot above knee, in abdomen chest, neck face and back, out of which six died, three had to undergo amputation and remaining one’s are recuperating with serious injuries. The citizen’s inquiry committee which went to Dhule for fact finding was shocked out of its wits to find as to how the event which required a simple intervention from the police grew into the tragic incident. The mater was too trivial; the victim came to police chowkie to complain and with a request to intervene. Police constables on duty, apparently told the victim to go and settle the issue himself. The victim a Muslim auto rickshaw driver came with few more youth, the youth from other side also collected and stone throwing began. The clips, taken on video; show that the police acted as a cover for the Hindu mob which charged towards the Muslims. The police force also seemed to have begun to violate the police manual in letter and spirit. The mandatory loud speaker announcement, use of tear gas, lathi charge to be resorted before firing was done away with and a straight firing was resorted to. The police training says the firing should be to disperse the mob, begin with firing in the air and then below the knee. In Dhulia the police thought it is a redundant exercise, so the firing was a targeted one, above the knee, above the waist, in abdomen, chest, face, neck and back. The victims who fell to the police bullet were left to be taken to hospital by friends and relatives. Police claims they were attacked seriously, acid was thrown on them. The civil hospital record shows that all the injuries suffered by police were minor. Some of them were admitted to hospital wards to show that they have been attacked seriously. No case of serious acid attack on the police, no case of serious injury, which requires hospitalization! The mob burns the houses; mostly those of Muslims, few Hindu households are also burnt. Police did not entertain any FIR of the victims. Next day morning the area is washed clean to wipe out some remaining evidence. Those wanting the FIRs to be filed were told that since they are themselves culprits of violence, filing FIR will go against them. A rumor was floated that combing operation will be done in Muslim areas. The victims in Hospitals take early discharge fearing that they will be charged as being the rioters in the violence. The civic administration did not set up any relief camp for those whose houses are burnt. Ration was distributed knowing fully-well that those whose houses are burnt cannot cook as all cooking vessels and utensils are burnt. The political leadership, Chief Minster and co. is apathetic and it takes them 10 days before driving down a distance of few hours to assess the situation, to address the woes of victims and to announce the much needed compensation. The compensation announced is meager for reasons best known to the Chief Minster. What trust the victims will have in such state machinery? A feeling of utter neglect and helplessness is prevailing amongst the victims. Some relief has been provided by the community organizations. That does not help the matters beyond a point. The violence in Dhulia comes in the backdrop of violence in Akot, Raver and other places in the region, over a short span of time. There is an urgent need for better relief, setting up of Police-Civic society Mohalla committee, sensitization of police in communal matters and to counter the misconceptions widely prevalent about the minority community. Who will undertake all these? Can Government think out of the box and take initiative in this direction? Who will get justice to the victims? And will the Central Government muster courage to bring in the Communal Violence Prevention Bill, which was presented in National Integration council. The draft bill can be modified by standing committee before finalizing. This bill should at least ensure that the section of political leadership, bureaucracy and police will not be spared for their acts of commission and omission due to which violence occurs and keeps simmering.